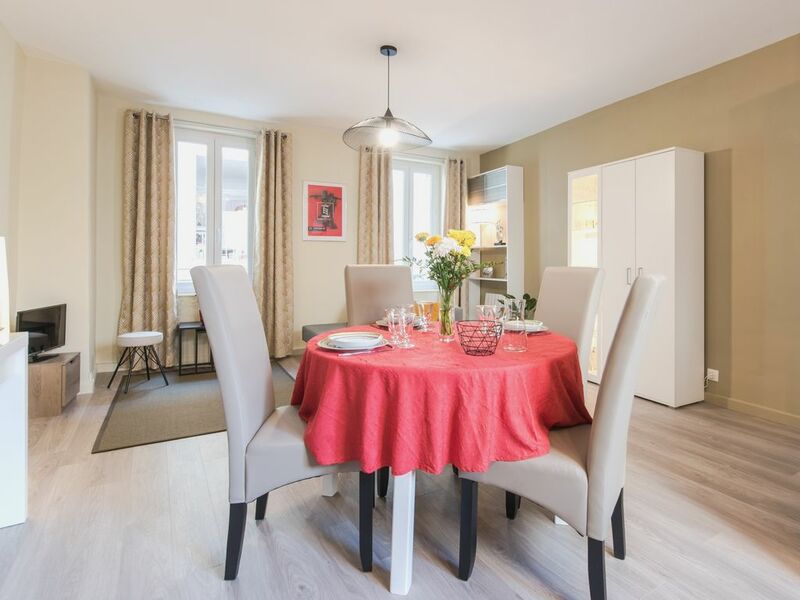 Located in the historic center, less than 200 meters from the Palais des Papes and the Pont d'Avignon, this apartment features free Wi-Fi and air conditioning. There is a full kitchen and a flat-screen TV. This accommodation is highly rated by the hosts who stayed there. It is the favorite district of the travelers visiting Avignon. Located on the 2nd floor, this apartment of 45 m² has a fully equipped open kitchen (dishwasher, oven, induction hob, toaster, microwave, kettle, coffee machine with capsules at will ... ). The living room includes a TV, a wired high-speed internet connection (fiber) or free wifi a sofa bed (140 x 190) and air conditioning. The independent bedroom has a very comfortable double bed of 1.60mx 2.00m and ample storage space. Towels and sheets are provided. The bed is made upon arrival. Thank you very much, Cesareo, for your nice comments. I am very happy that your stay has gone well. Good continuation of your stay in France. Catherine and Jean Michel were very gracious and welcoming hosts, showing us around the apartment and providing us with great information about Avignon. The apartment is in an excellent location in walking distance to attractions and the central train station. Everything in the apartment is top quality and well decorated to make you feel very comfortable. My daughter particularly appreciated the comfortable sofa bed! We would recommend this apartment for a stay in Avignon. Thank you very much Mardi and Michaela for your comments, it's very nice of you. We were very happy to welcome you because you are both very friendly. We found the apartment perfectly tidy and clean after your departure, so I highly recommend Mardi and Michaela to all apartment owners in Abritel - HomeAway. 100% attention to every detail. Perfect! Accueil parfait de JMichel et Catherine. L'appartement est idéalement placé, clarteux, calme et d'une propreté irréprochable. Merci Chantal pour votre élogieuse appréciation. Nous avons eu beaucoup de plaisir à vous accueillir ainsi que votre famille et vos amis, tous autant joyeux et sympathiques les uns que les autres. Nous vous remercions vivement car nous avons trouvé l'appartement très propre et parfaitement bien rangé après votre départ. Nous espérons que vous avez apprécié les spectacles du festival.